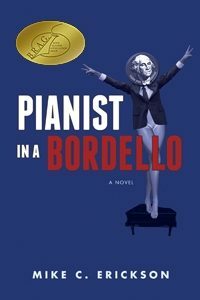 The award winning novel, Pianist in a Bordello, garnered a nod by the Northern California Publishers and Authors for third place in General Fiction. It was also awarded two first places in fiction and humor by the Colorado Independent Publishers Association. In addition, PIAB was re named as a recipient of the coveted BRAG awards. Publishers Weekly, Red City Reviews and Kirkus Reviews all included it in the top ten percent of Indie books that were submitted. The gold standard of book promotion, BookBub recently accepted Pianist in a Bordello for a featured position in their newsletter. BookBub only accepts between ten to fifteen percent of the hundreds of books submitted daily. Pianist in a Bordello was top pick and finalist for Underground Book Reviews, Novel of the Year.